We’re understandably proud of our music history in Macon. We’ve nurtured and exported some true legends, and we especially adore rebels and rule-breakers. Think of dainty powerhouse Little Richard, who cut his musical teeth on gospel tunes, then went on to break rock ‘n roll ground belting out “Tutti Frutti,” a scrubbed-up version of a scandalously raunchy song. Or the Allman Brothers, angel-faced blonde hippies soaked in soul and R&B, who had a black drummer – Jaimoe – in their band, back in the day when that’d get you kicked to the curb at some clubs. Here, our icons are iconoclasts who transcend expected boundaries. Even our city slogan, “Where Soul Lives,” resists easy interpretation. There’s soul as in the spiritual part of us all; soul as in emotional energy and intensity; soul as in black American culture. Hip-hop and rap is the defining, influential voice of that culture today. Angry, funny, boastful, political – the content varies, but at its core rap is pure, raw self-expression and ingenuity. Rhyming as communication always has been a human impulse, but rap surrounds those rhymes with dense and powerful cultural context. It’s music largely made by marginalized people who refuse to stay in the margins, and demand the spotlight instead. Critics of the genre would do well to set aside preconceived notions and view the music on its own terms. It’s exuberant, insightful and innovative, and it’s no surprise that Macon is the incubator for some extraordinary talent in that area. Pink, aka Christy Martino-Thomas, is originally from Huntington, Long Island, and her trademark pink dreadlocks earned her the nickname she’s had for 25 years. Pink lived in Atlanta for a decade before she visited Macon and fell for an “ol’ country boy” who would become her husband and permanently settle her in the midstate. With a background in entertainment and club promotion, Pink liked Macon’s vibe much better than Atlanta’s, so she started doing the work she loved: throwing parties at urban clubs around Middle Georgia, bringing in hip-hop and R&B musicians, and promoting her up-and-coming clothing line. An entertainment entrepreneur’s work life is wildly social, and Pink found herself traveling often to Atlanta to attend open mics and other showcases, hoping to get her merchandise into artist’s hands for the free promo. At the Macon club Sparks, she met a young rapper named Bob Lennon who started accompanying her on some of those late-night road trips. At barely 20 years old, Bob stood out from his peers. He had a head full of asymmetrical dreads, wore skinny jeans and bright Converse high-tops, and wasn’t afraid to take a fashion risk by, for example, showing up to perform wearing his grandma’s leather jacket (something he laughs about now). His sound was unique: He rapped in a slowed-down cadence with a raspy, singsong edge to his voice. He used pronunciation as a kind of instrument, sometimes stretching words way out or warping and repeating them, sometimes adding a pitchy edge; his hooks were catchy and clever. And he was always, always willing to put in the work. Pink was impressed. Christopher Powell Jr. has been going by Bob Lennon since late 2012. Chosen as an homage to the talents of Bob Marley and John Lennon, he’s been “on a pilgrimage to back up the name” with his own creative work ever since. Bob grew up in East Macon, raised by his grandparents, who he credits as deeply positive influences in his life. 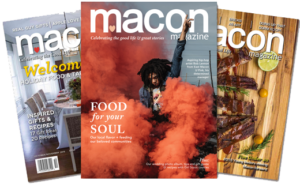 “Macon can be a hard place to be a kid, and I’m grateful I had them to balance me out,” he said. In addition to Boy Scouts and church, Bob’s grandparents also nurtured his interest in golf. This tenacity served Bob well. He landed a golf scholarship at Abraham Baldwin Agricultural College, and though he dropped out of school early to pursue his music career, he worked as hard as ever, writing new songs, finding new places to perform, making new videos – swinging and swinging, hoping for connection. Then came Pink. Meeting her was fortuitous for them both; she hadn’t done artist management before, but many managers start as promoters, so she knew the basics. She loved Bob’s music, his confidence, his creative vision. She saw how hard he worked and how much his career meant to him, and he saw her consistency and dedication. Plus, everybody at the open mics already thought she was his manager – since they were always together – and that’s what gave her the idea to bring it up with him in the first place. Once she asked, it didn’t take Bob long to say yes. A good manager takes care of everything so their artist can focus on music. “Everything” entails making personal financial investments: “A lot of times now, it’s up to the artist to cover things like studio time, paying for beats, mixing, mastering. But I’m old school and I was taught by old school people, so I used my own money to invest in Bob – and it’s different when it’s your own money,” Pink said. Pink’s own daughters are grown with careers of their own, but so many of the skills that make her a good manager – tough love, devotion, the ability to multitask and to run on frighteningly little sleep – were built by being a good mother. Although Pink has believed in Bob since day one, initially he had trouble finding his niche in Macon’s music scene. He didn’t always fit in at more urban venues because of his quirky look and sound, and most of the downtown bars at the time weren’t booking rap acts. Bob continued to build his fan base by performing across the Southeast until eventually his perseverance and talent had his hometown’s attention. 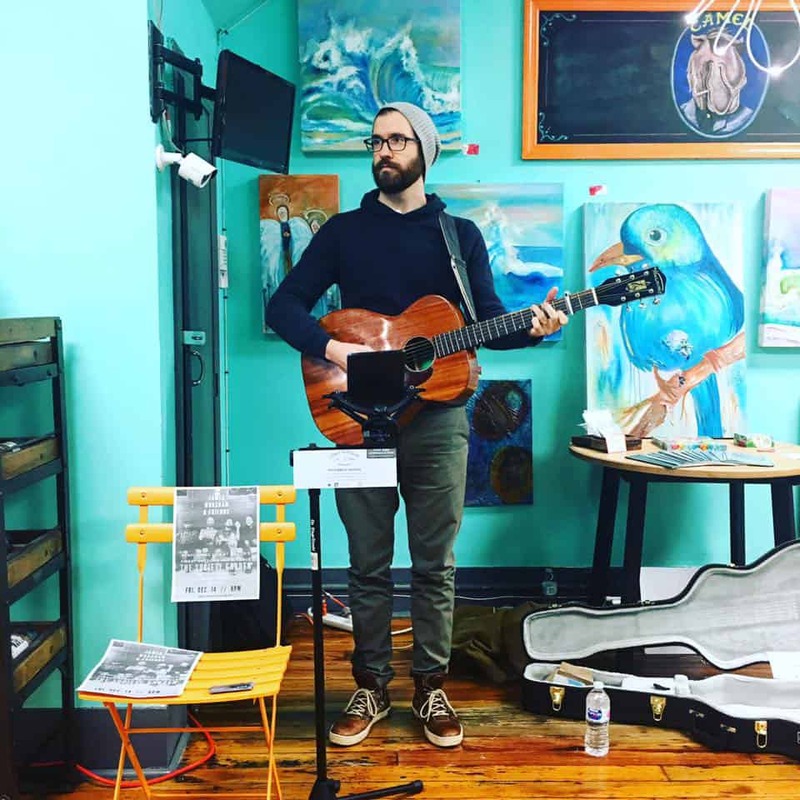 Bob won The 11th Hour’s Reader’s Choice award for Best Local Hip-Hop in 2017 and 2018 and performed at the ceremony both years, and he’s since opened for Bone Thugs ‘n Harmony at the Hargray Capitol Theater, been a featured artist for the Hargray’s Grab Bag local showcase series, performed at Bragg Jam, and shared the stage with Waka Flocka at the Georgia Theater in Athens, among other places. Bob also performed at the iconic arts festival South by Southwest in Austin, Texas, in 2017 and 2018. In summer 2018, Bob, who has two children of his own – 4-year-old Christopher and 1-year-old Amir – stepped offstage and took the time to speak about his career to a group of kids at a Dublin summer camp, something he said he enjoyed and would like to do more of once his schedule calms down. For Pink, operating in the mostly male-dominated field of artist management has come with some struggle. For now, Pink is focused on working with Bob, but in the future she hopes to open her own management company, Classy Diva, and add more artists to her roster. “I will never let anybody who has looked down on us see us fail. That will never happen,” Pink said, and she’s right. In 2017, Atlanta rapper Waka Flocka signed Bob to his Brick Squad Monopoly label, and Bob’s career has been taking off ever since. 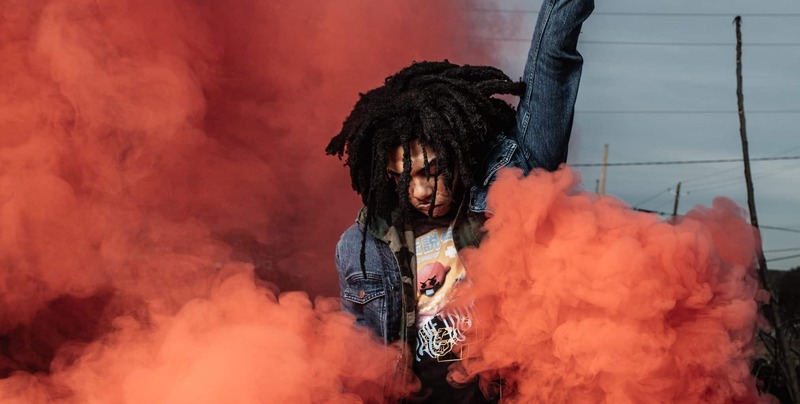 Bob’s EP “Ashtrays” is out now, gathering praise from listeners and critics alike, and he’s busy creating new music and videos, including a soon-to-be-released project with producers J.U.S.T.I.C.E. League, who have worked with artists such as Mary J. Blige, Rick Ross and Lil Wayne. Like the rock star he is, Bob Lennon exudes unbothered confidence. He isn’t jealous, because he knows his talent, and he knows his worth. Together with the unstoppable Pink, he’s writing another unorthodox success story in the pages of Macon’s musical history.